This is my new favorite chocolate pound cake. Preheat the oven to 325 degrees F. Spray a 10 inch tube pan very generously with flour added baking spray. Set it on a rimmed cookie sheet. Mix the flour, cocoa powder, baking powder and salt together in a bowl and set aside. Grind the sugar in a food processor and set aside. In the bowl of a stand mixer with the paddle attached, beat the butter and shortening until creamy. Gradually add the sugar and continue beating for five minutes. With the mixer on low speed, add eggs one at a time, beating on low speed after each egg is added. When all the eggs are incorporated into the batter, scrape sides of the bowl and increase the mixer speed to medium high. Beat on medium-high for about 5 minutes. Beat in the vanilla and the coffee. With mixer on the lowest speed (or by hand), add the flour mixture and buttermilk alternately, beginning and ending with flour mixture. Add the water and stir until incorporated. Pour into the greased tube pan. Hold the cake batter about 4 inches above the counter and drop it to remove air bubbles. Set it back onto the baking sheet and bake for about 80 minutes or until a cake tester inserted in the center comes out clean. 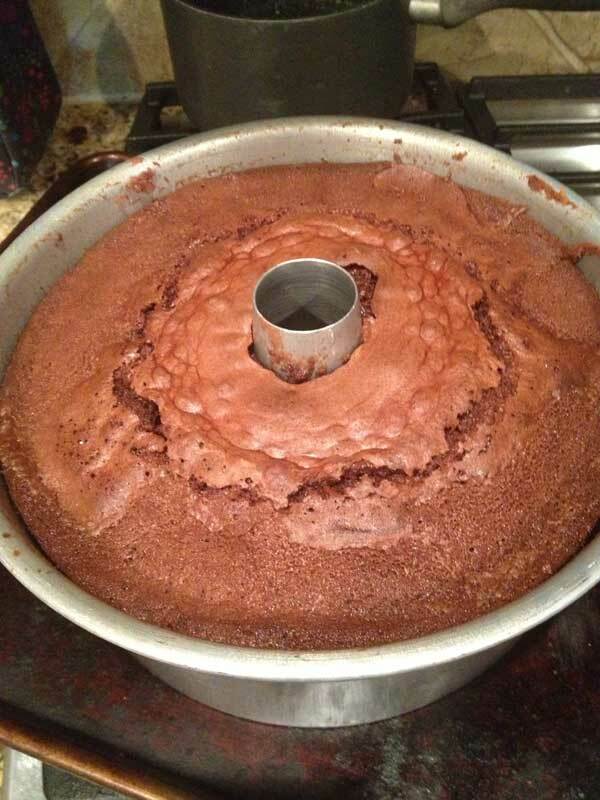 Let the cake cool for about 10 minutes in the pan, then carefully invert. Let the cake cool completely, then make the icing. To make the icing, melt the butter in a large (2 cup) microwave safe bowl or measuring cup. Stir in the cocoa powder and powdered sugar, then gradually add the cream, stirring until shiny and smooth. Stir in the vanilla. Pour over the cake before the icing starts to set. For the buttermilk, you can substitute SACO buttermilk powder with 8 oz of water. Some people add the powder with the dry ingredients and then add the water with the wet ingredients, but I like to dissolve the buttermilk powder in the water to get rid of any lumps. For the coffee, I used a pack and a half of Folgers Black Silk.